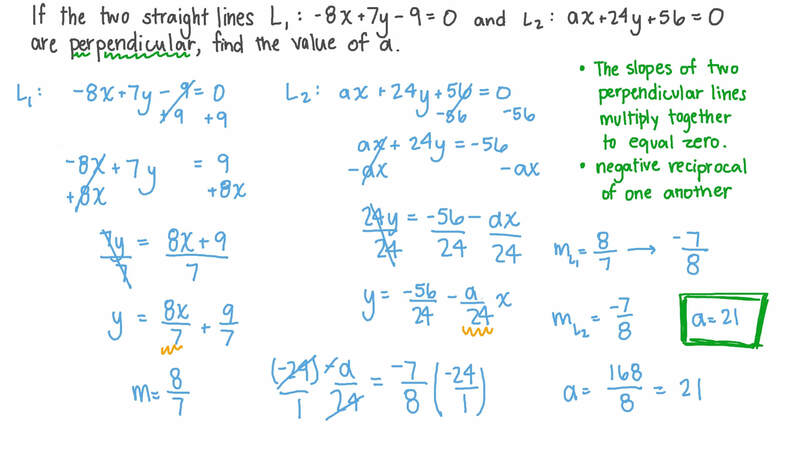 In this lesson, we will learn how to find the equation of a straight line that is either horizontal, parallel, or perpendicular to another line. Which of the following lines is perpendicular to the line 1 9 𝑥 − 3 𝑦 = 5 ? Lines 𝐴 and 𝐵 are perpendicular to each other and meet at ( 1 , 4 ) . If the slope of 𝐴 is 3 2 , what is the equation of line 𝐵 ? 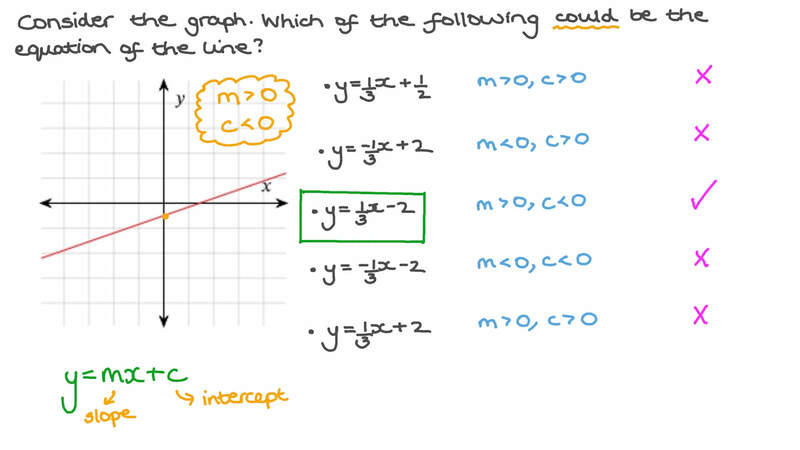 Which of the following could be the equation of the line? Which axis is the straight line 𝑦 = 3 parallel to? Write, in the form 𝑦 = 𝑚 𝑥 + 𝑐 , the equation of the line that is perpendicular to the line − 5 𝑥 + 2 𝑦 = − 6 and that intercepts the 𝑥 -axis at 20. Write, in the form 𝑦 = 𝑚 𝑥 + 𝑐 , the equation of the line through 𝐴 ( 5 , − 8 ) that is perpendicular to 𝐴 𝐵 , where 𝐵 ( − 8 , − 3 ) . In the figure below, 𝐿 ⫽ 𝐿 1 2 and 𝐴 𝐵 = 8 length units. If the equation of 𝐿 1 is 𝑦 = 4 5 𝑥 + 4 , find the equation of 𝐿 2 . Find the equation of the straight line passing through the point ( − 1 , 1 ) and perpendicular to the straight line passing through the points ( − 9 , 9 ) and ( 6 , − 3 ) . If the straight line passing through the two points ( 2 , 8 ) and ( 3 , 3 ) is perpendicular to the straight line whose equation is 3 𝑥 + 𝑘 𝑦 + 8 = 0 , find the value of 𝑘 . If the two straight lines 𝐿 ∶ − 8 𝑥 + 7 𝑦 − 9 = 0 1 and 𝐿 ∶ 𝑎 𝑥 + 2 4 𝑦 + 5 6 = 0 2 are perpendicular, find the value of 𝑎 . The straight lines 8 𝑥 + 5 𝑦 = 8 and 8 𝑥 + 𝑎 𝑦 = − 8 are parallel. What is the value of 𝑎 ? The line 𝑦 = ( 𝑎 + 5 ) 𝑥 − 6 is perpendicular to the line through points ( − 8 , 2 ) and ( − 2 , 5 ) . What is 𝑎 ? The square 𝐴 𝐵 𝐶 𝐷 has an area of 13, and the corner 𝐵 has coordinates ( 2 , 1 ) . Give the equation of ⃖     ⃗ 𝐶 𝑂 in the form 𝑦 = 𝑚 𝑥 + 𝑐 . Given 𝐴 ( 4 , 4 ) and 𝐵 ( 2 , − 4 ) , find the equation of the perpendicular to 𝐴 𝐵 that passes through the midpoint of this line segment. Give your answer in the form 𝑦 = 𝑚 𝑥 + 𝑐 . The line 4 𝑥 − 3 𝑦 − 2 4 = 0 meets the 𝑥 - and 𝑦 -axis at points 𝐴 and 𝐵 respectively. 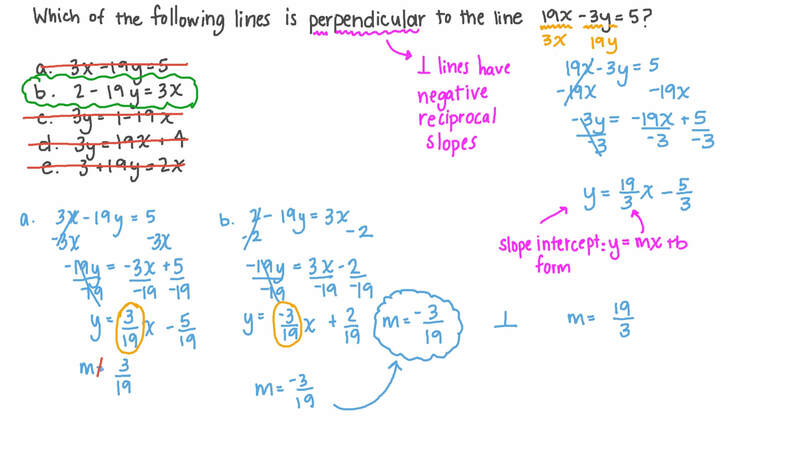 Find the equation of the line perpendicular to 𝐴 𝐵 and passing through its midpoint. Given 𝐴 ( 2 , − 7 ) and 𝐵 ( − 8 , 1 ) , what is the perpendicular bisector of the segment 𝐴 𝐵 ? Let 𝐴 and 𝐵 be the 𝑥 - and 𝑦 -intercepts of the line 5 𝑥 − 3 𝑦 − 6 = 0 . Give the equation of the line parallel to the 𝑦 -axis that passes through the midpoint of 𝐴 𝐵 . Which axis is the straight line ⃑ 𝑟 = ( 2 , 5 ) + 𝐾 ( 0 , 1 ) parallel to? If lines 𝑦 = 𝑎 𝑥 + 𝑏 and 𝑦 = 𝑐 𝑥 + 𝑑 are perpendicular, which of the following products equals − 1 ?